“A Promise of Pure Gardenias” by Jackie Williams is a wonderful historical romance. Being a fan of Jackie Williams amazingly sensitive and enjoyable military romances (yes, military) I was reluctant to venture into a new series, but I’m pleased I did. Brendon Spencer is introduced to us as a young lad in 1799, experiencing a rude awakening from his innocent childhood play. Some six years later his personal reputation is stained and his heart is captured in an odd and twisted incident. What follows is the complicated courtship between Brendon and Sophia, full of chemistry but also misperceptions – a hint of Pride and Prejudice I might say but definitely not in the copy-cat kind of way but in a ratehr delightful interplay of it’s own flavour. Two strong characters whose interactions easily fills a book or two. 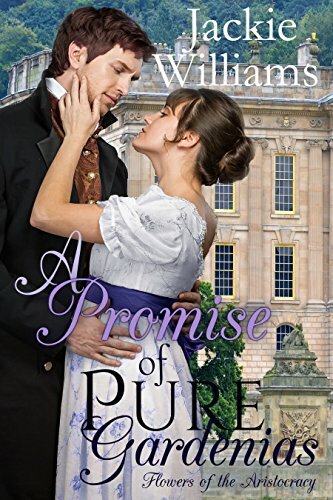 Set in the romance-inspiring Regency period, with eloquent and masterfully floral use of language, wit and humour, this is a very enjoyable and compelling read that should please fans of the genre and those willing to venture into it. He had been about to go down on his knees, beg her to make him the happiest of men, when Sophia Barclay had suddenly spoken, her lilting tones ringing loud and clear. ‘I won’t marry Brendon Spencer! I absolutely refuse!’ Saved him a world of indignity, he supposed, but the rejection still cut deep. Even taking a mistress hadn’t lessened the pain. Especially when that mistress might have spilled his secret. A secret that he would rather cut off his nose than reveal. Drat the man! How dare he barge back into her life and make assumptions. Brendon Spencer had abandoned her, and had taken a mistress for a whole year! What gave him the right to become so affronted? Sophia would go to breakfast with whomsoever she liked, regardless of propriety! Why should she care what he thought? No one had worried about her while she was alone, certainly not that pompous arse! But her heart throbbed at the sight of him and her insides fluttered alarmingly, even while the humiliation of unrequited love burned deep. How could she still want him when he clearly thought nothing of her? With his father in imminent danger and responsibility threatening fast, can Brendon face his fears and contain his legendary temper long enough to win the woman he most desires? A Promise of Pure Gardenias (Book 2 in the Untamed Regency series) is a standalone story suitable for ages 16 and upwards due to sensual love scenes and adult language. The series is best read in order to appreciate returning characters and places. My wonderful parents brought me up with a huge love of books. We read anything and everything. Bedtime stories were a treasured time of adventure and mystery. My sister and I sat wide eyed in wonder and to this day I worry about Dinah and Dorinda being pricked with pins because they grew so fat, and I never pull faces at the a waning moon (or was it a waxing one?) just in case my chops stay that way . (The Wind On The Moon)I began reading romance while still at school. The fuel for many a teenage fantasy leapt from between the covers of wildly romantic books and my passion still lingers now for all those dashing, dark haired heroes. My own beautiful daughter persuaded me to write my first romance. She enjoyed the resulting tale so much that she shared it with her friends and I eventually published A Perfect Summer as an ebook on amazon. But I have discovered that this writing bug is not easily stopped. It has turned into a grand passion that I just cannot hold back. Ideas come flooding in the strangest of places. While driving the car, when choosing ripe avocados in the supermarket, even during sweaty sessions at the gym, far too many for just one book and so I began another and then another. Eight years and twenty-five books later I am still nowhere near done. Book 26 is on its way and only just the other night I woke from a wild and wonderful dream with yet another plot fully formed in my head. Reblogged this on Romantic Suspense Books. It sounds fun. Thanks, Christoph and good luck to Jackie! 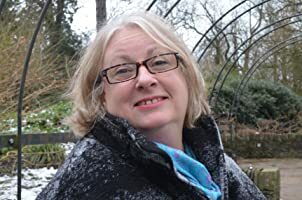 Check out the book, A Promise of Pure Gardenias, by Jackie Williams, as reviewed on Writer Christoph Fischer’s blog.